Heather has always joked that she would like to be buried with a bag of worms to help her on her way back to the earth. A bit extreme maybe, but more and more people are now choosing green burials in wild meadow or woodland sites rather than municiple cemeteries. When you start to look at funerals from a green point of view, it does become rather troubling. Have you stopped to think about where the wood to make coffins comes from? And what about those floral tributes spiked into oasis? Like most flowers, they have probably travelled 1000s of miles to get to you. OK, well, what about cremation? I find it shocking to discover that each cremation produces on average about 50kg of CO2, or that the mercury from dental fillings is emitted into the air. All in all, dying is an environmental minefield! But there is an alternative and green funerals are on the rise. There are now more than 200 natural burial sites around the UK. Some of the sites near to us are truly beautiful. Have a look at the Humber Woodland of Remembrance. The owners are as much guardians of wildlife as guardians of a burial ground. Diane Thomas uses the Natural History Museum's postcode plant database as her bible of what is allowed to be planted there. Another magical place is Usk Castle Chase which is run by Native Woodland. Again the site is managed to maintain it's natural habits. 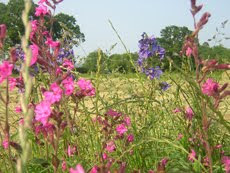 The Gwent Wildlife Trust have helped to plan the burial scheme and promote wildlife conservation. Now this brings me back to the issues of flowers and floral tributes. Of course a wreath of MUM in white carnations is just not going to fit in to these tranquil settings. But a Wiggly Florist sheaf of English flowers, local foliage, all hand tied with rafia, would be simple, seasonal and natural. So I'm making it my mission to change the face of British funeral flowers and spread the quiet, peaceful beauty of Wiggly flowers to funerals across the land. Oh, and I'm off to book myself a plot! well, urban foraging brought me home about 10 brambles wrapped up in a muslin square -- not great so i've had to hit the farmers market a few miles away for some damsons. i'd somehow blocked out the pain of picking out all those damson pits from the last time i made jam -- next time someone stop me! point being however that there is a distinct surfeit of concrete and weedy patches round here which could, with some love, be turned into productive growing space. something which is particularly on my mind today as i've be watching a woman and her daughter who go up and down our street looking through the bins for food. makes you stop and think. one positive re(action) to all this is guerilla gardening -- check out the blog (or if you're into print in the way i am its a beautiful little hardback book). i'm wondering about sending some seed bombs into next door's decaying garden ! We've got better delivery rates for Highlands and Islands..
You may remember that last year we had to pass on surcharges for delivery to the far flung corners of the UK, which made Wiggly delivery for some customers very expensive. Since then we have been looking for a way to improve this situation, and finally we've got it. For the most part I love butterflies and do everything I can to encourage them, along with other beneficial insects (bees, ladybirds and lacewings etc) into my garden. Not only do they help pollinate the plants but we're helping to keep their numbers up in these desperate times (times where even the bees are disappearing faster than our pensions). The garden without nature flitting from flower to flower and singing in the trees just doesn't seem complete and lazing in your garden (children permitting of course) on a warm and sunny day gives great pleasure, a feeling of well being and quite often a desire to drink beer. Maybe that's just me. But this year my enjoyment has been marred somewhat, and it took me a little by surprise. For this is the year that I decided to grow some vegetables outside – I purchased a couple of raised beds to complement my array of potted vegetables and, using the contents of my wormery and Bokashi bins (as well as a hefty dose of compost from my three compost bins) set about creating what I hoped would be some very successful (though admittedly quite small) vegetable plots. Planted up with cauliflower, spinach, rocket, onions and a few carrots they soon filled out and I have been astonished at how well everything has grown, as well as how much food can be produced from such a small area. The cauliflowers expanded at such a rate that from early June we were lobbing off the odd leaf for our tea and one leaf, along with some spinach, was often more than enough veg on the side of a meal for the wife and I. The florets of the caulis soon followed, filled out nicely and, even with such a small plot, we were harvesting more than we could manage and had to give a few away. But where were the pests everybody complains about? There were no carrot fly on the carrots, very few slugs and no pests on the leaves. I thought (rather smugly) that I had it made – that or the Bokashi has some other magical ingredient for keeping the beasties at bay. But that was in June when it was very hot – as soon as the rains of July arrived all hell broke loose. Suddenly there were slugs everywhere (early morning and evening patrols were required and were reasonably successful I thought) and, whenever the sun came out, the butterflies appeared. Previous years joy at seeing a pair of Cabbage White's flitting around the garden together soon turned me into a Victor Meldrew as most of their 'flitting' was being done all over over my lovely cauliflowers! I couldn't squash the eggs quick enough and there were soon lots (and I mean LOTS) of small caterpillars hatching out. Who can believe the speed these little so and so's grow! And the more they grow the more they eat, until a mere two weeks later we are left with two small patches of doilies, I mean cauliflower leaves, that have no chance of recovery! Luckily we have finished the florets now, but I did read that new ones will grow if the plant is left intact (and it has some leaves to take up the rays of the sun of course, unlike mine). So next year I will be extra careful, less smug and will even try some of the organic brews for deterring them from laying. There are a number of brews you can use as an organic gardener, such as soaking nettles in a bucket of water until they rot down and the water stinks. It's very nutritious as a feed and the theory is that it smells so bad that the butterflies won't land on the leaves to lay their eggs. Definitely worth a try next year I think. I've also read that companion planting with celery will also deter the cabbage white. The trouble is that celery deters me as well as I hate it, but it's probably worth a try. I'm sure there are other great methods for deterring pests so why not leave a comment below or share your methods in the Wiggly Wigglers Facebook group? there's no denying it -- the garden knows before i do. i look at the flowers who have dropped their petals overnight and am sort of startled awake -- that time already? soon i'll be harvesting the winter veg that i put in as a 'long term' project and saying goodbye to all the soft new growth on my fruit trees. it comes, and it goes and it keeps on rolling forward. but geese overhead take me back to my dad shouting for a younger me as i rush from wherever i am -- hurling myself down the stairs and into the backyard eyes skyward -- a migrant himself in Canada he never tires of the romance of the geese and their seasonal flight.